I have been quite remiss with my blog this week. So to make up for it I am going to post three cards in this post. You will notice a theme as they all use Basic Grey's Origins line. Yes, that line of paper once again. As someone who hoards patterned paper (and nearly everything else) I can stretch the use of it like no one's business. Think of me as the Ebenezer Scrooge (only that I like to make my money stretch not that I say "bah humbug!" a lot or that I have a nasty demeanor) of crafting--I reuse, recycle and repurpose. I have a feeling that one reason I love stamps so much is I don't feel I am losing anything by using them. They are reusable over and over again unlike paper, ribbon, stickers, rub-ons, buttons and the like. I use those sparingly. In fact I rarely use patterned paper (and stickers even more rarely) so all these Basic Grey Origin cards are a lark for me. I truly am trying to reform. 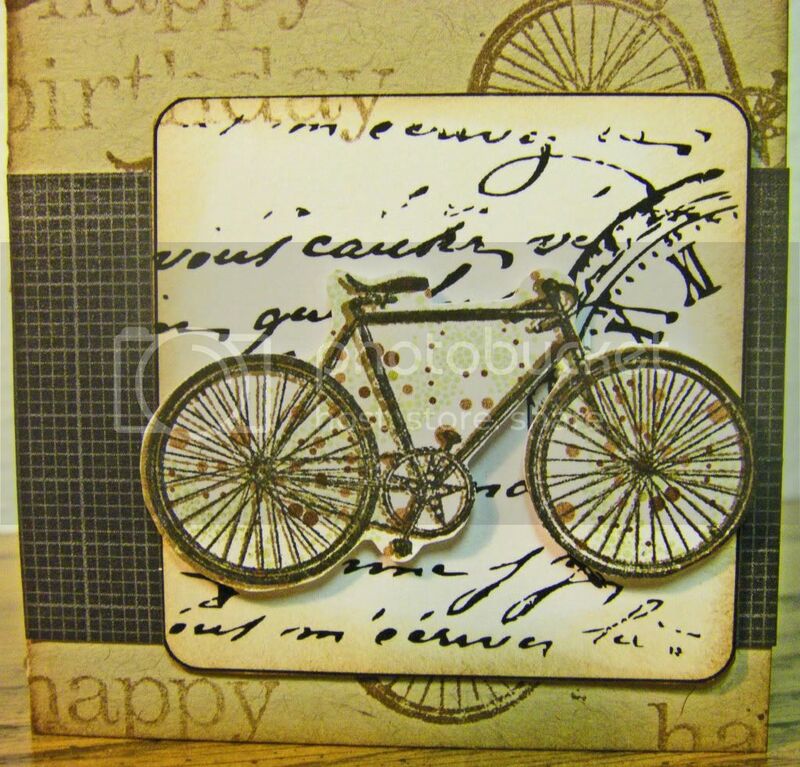 First up is a little card made of scraps from kraft cardstock from my Christmas Cookie Recipe Book project. 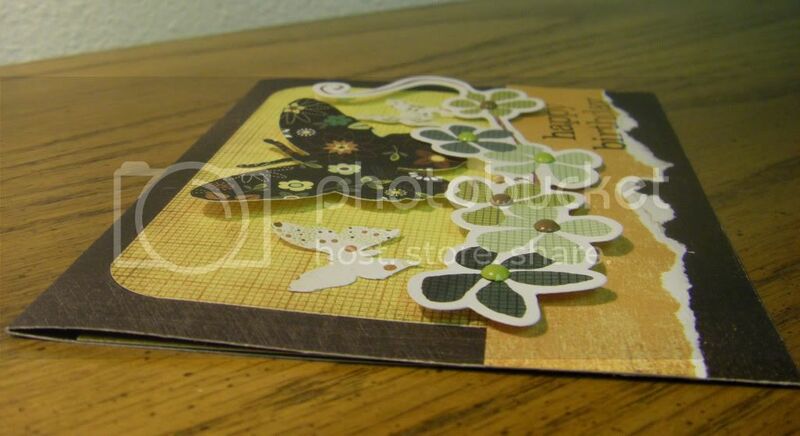 These pieces of cardstock (measuring 6 inches by 5 inches) make the most interesting small sized cards (3 inches by 5 inches) which I would have never used had I not had a stack of them to use up in whatever way I wanted. Yes, it is another masculine card. 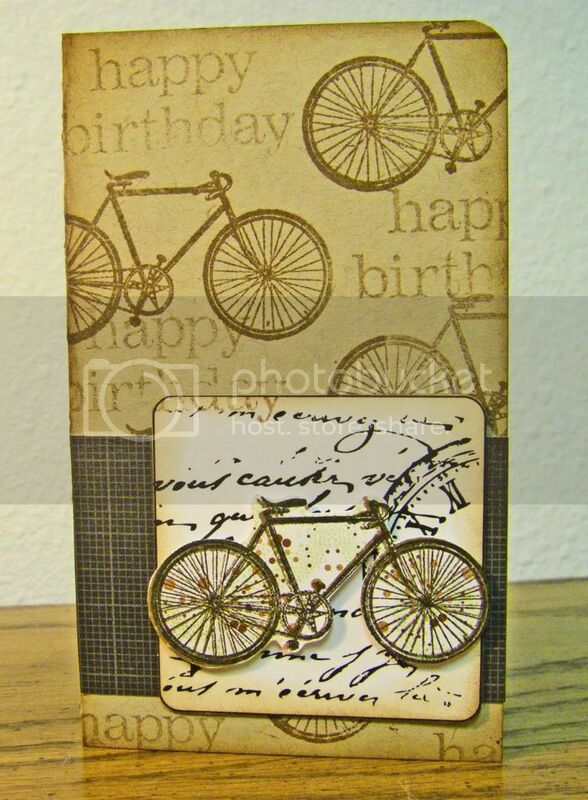 This one showcasing a bicycle stamp by Studio Calico. Isn't it a great stamp? The other element I wanted to specifically mention is the square the main bicycle is upon. That square is from a digital kit I bought and downloaded from House of 3. If you have never been to House of 3's website go, go, go, now, now, now! They have sensationally wonderful digital (and physical) products. 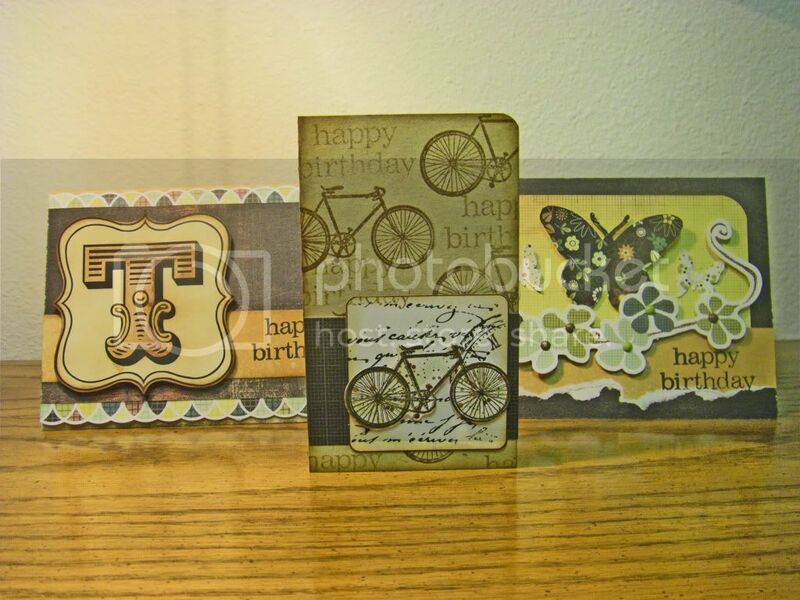 Often the products have printable elements that take no fuss if you don't want to mess with the elements digitally. I found a whole sheet of these printable "blank" squares in my Magnet Board Project Kit and they are fabulous!! I plan on using them many, many times in the future. The next card is using the Basic Grey Origins line to make a feminine card (I know you are saying, "At last! Does she every do feminine cards?). 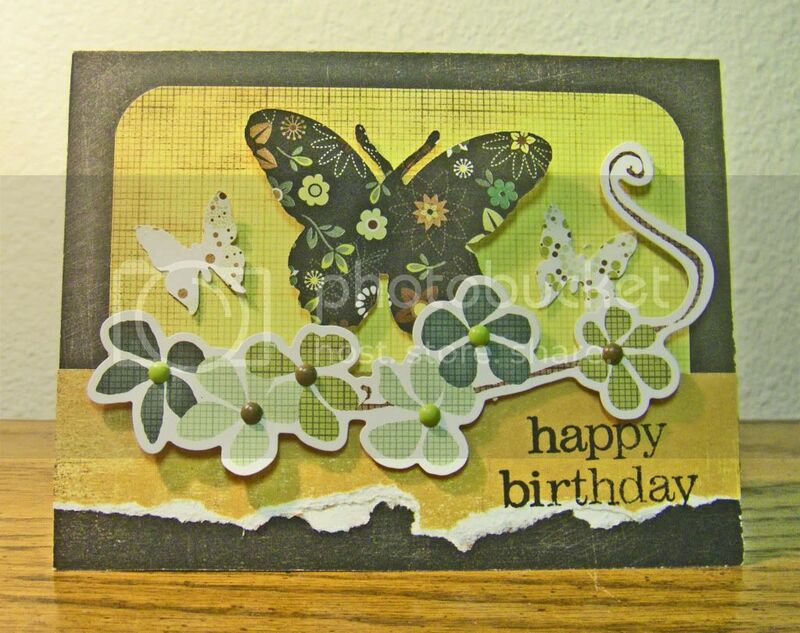 I can't claim any part in the card design as I started the card in that Basic Grey card class so it is all Basic Grey, but I did pop up the floral cardstock sticker and I added the butterflies all on my own (wow, am I original!). Wednesday night, I thought the card was sort of shoddy and I felt I had really "cheated", but I felt better about the card in the light of day. Lastly, is another masculine card using the Basic Grey Origins line and another amazing printable by House of 3, this time from the Monogram Printable Kit. 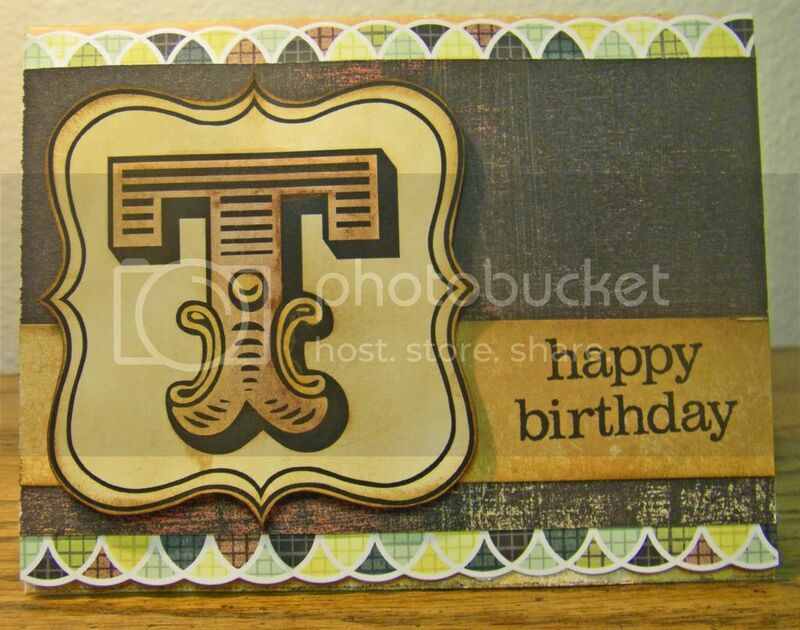 Each letter is different and can be used to personalize a card or gift or spell out words or names to make banners, scrapbook titles and any other thing your mind can dream up. Of course you can print the Monograms onto whatever paper you want, but I went with a natural white cardstock which I then distressed and also watercolored with some truly cool water-soluable wax pastels by Caran d'Ache which Donna Downey introduced to my friend in a class she took with her who then introduced them to me in a class I took with my friend (talk about confusing!). In fact in my draft posts I started writing about the class my friend taught, my awesome friend and these water-soluable wax pastels so one of these days hopefully I will post it. I hope you have enjoyed these cards and thanks so much for visting the Hall! Other: Crop-A-Dile Corner Chomper, We R Memory Keepers; stampin' dimensionals, Stampin' Up! Other: Cuttlebug, Provocraft; Crop-A-Dile Corner Chomper, We R Memory Keepers; stampin' dimensionals, Stampin' Up! Other: Burnt Siena and Golden Cadmium Yellow, Neocolor II Water-Soluable Wax Pastels by Caran d'Ache; stampin' dimensionals, Stampin' Up! Lace for Men? Why Not.